Summary: "It happens at the start of every November: the Scorpio Races. Riders attempt to keep hold of their water horses long enough to make it to the finish line. Some riders live. Others die. Review: I realize I am in the minority here, giving it only two stars. Maybe my expectations were too high. I certainly didn't expect this story. 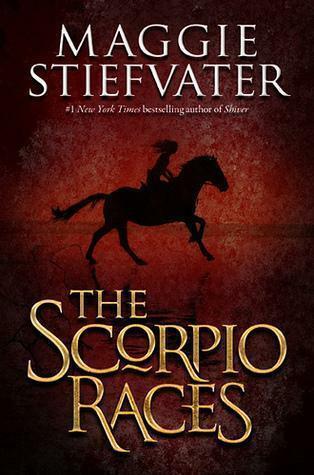 I just thought that a book called "The Scorpio Races" would actually feature The Scorpio Races before page 380 (out of 404). The build up was extremely lengthy, and the wrap up extremely brief. This book does the shifting perspective thing, where each chapter is from the point of view of a different character (sometimes switching multiple times within a single chapter). I tend to dislike that narrative device, personally, and this book was no exception. I really didn't care for Puck, though I loved her name. And, what the heck was the whole Gabe plot line? Also, the word "scorpio" makes me think of scorpions, which made me think that this book took place somewhere in the desert, probably in the Middle East, or maybe Africa. So the whole Irish thing really threw me. Am I alone on this? Anyone? Anyone? Ahem. Looking back, I can appreciate the atmospheric prose describing the island and its salty residents, but the story itself took forever to get through. I think that had I been warned about the pace of this story I would have enjoyed it more. As it is, this book was like a cup of green tea, which isn't a bad thing, but is a little jarring when you're expecting an Arabian red bull.